The discussion considered the different perspectives on the challenges of providing a good workplace for LGBT engineers. We heard first-hand the experiences of LGBT engineers working overseas in less-inclusive societies, and also the differences in working in the public vs. private sector. Approaches to LGBT inclusion networks was explored explored and some guidance provided on how to set one up within your own organisation. 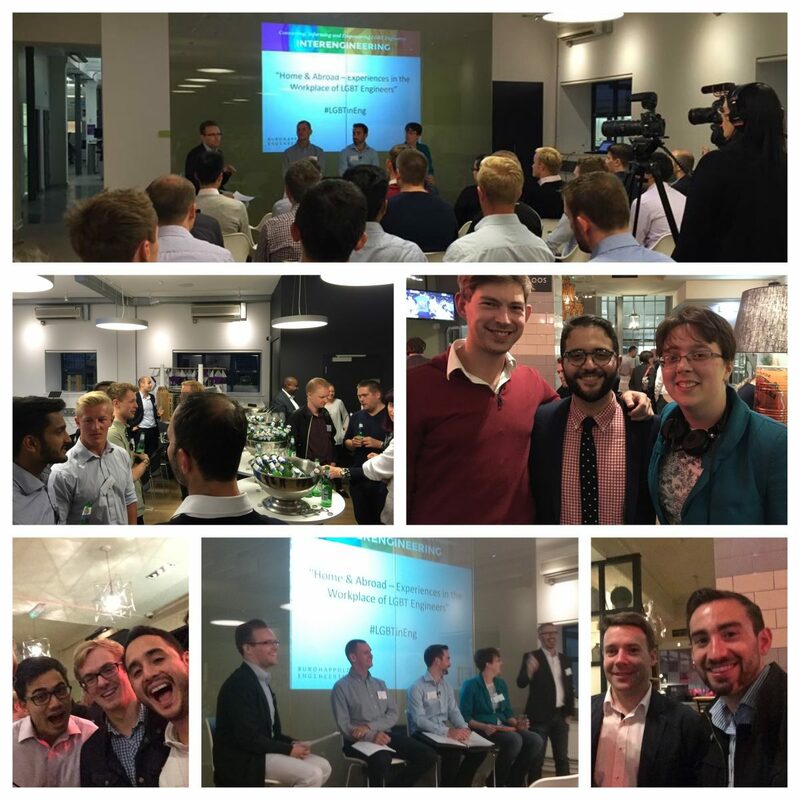 Each panellist outlined what it meant to them being an LGBT engineer. Hayden went on to outline his experiences of working in Singapore, a period in Angola and a short-lived phase in Algeria. His main advice for opportunities working abroad was to go for it and experience different cultures. However, you should be honest with HR and international mobility and to also be sensible i.e. know what the law of the land is in the country in which you are working. A word of caution when working on expatriate assignments which are joint ventures. Protections afforded by UK law may not apply therefore leaving you exposed. This touches on the main dilemma for LGBT considering working overseas in less-inclusive environments. Can you work in an environment where you may not be able to for your own safety, be your own authentic-self? Do your research into your potential host country’s laws. Barnden spoke about the benefits of the LGBT network at D&ES. By taking an active part, it has given her access to a wider range of colleagues (functions and grades) to speak to than she would normally experience as a junior engineer which is good for her development. Many at D&ES commute in from rural areas and as such do not have access to the LGBT community and support structures that LGBT people living in places like London do and work network can act as this community and support. Barnden went on to note that there is a Defence specific Diversity and Inclusion Programme which she sees as indicative of the desire to improve the Civil Services as a whole for LGBT+ inclusion. On the point of being a role model for future engineers, Barnden indicated that having visible role models is important, and noted that being a lesbian female engineer is a minority within a minority in engineering. Not seeing visible senior lesbian engineers above her makes wonder if it is possible to reach high levels of company. The event ended with Q&A discussing how it can be difficult to come out later in your career with the inertia behind you having always not been clear on the gender of your partner if you were not out from the beginning of your career. Another point noted was that seeing gay men reach upper levels of an organisation can be an inspiration for lesbian engineers with regard to positive attitudes towards sexual orientation. LGBT professionals can also make good managers, since they tend to have a high emotional intelligence from having been in the closet and therefore are tuned-in to softer communication. InterEngineering would like to thank the team at BuroHappold for hosting the event and also for providing the recording of the evening.